First things first, I’ve been tipped off that we will be seeing 5 new Energy Bras in the coming couple of weeks. 5 new colors!!! I really hope we see a grey, and Frond. 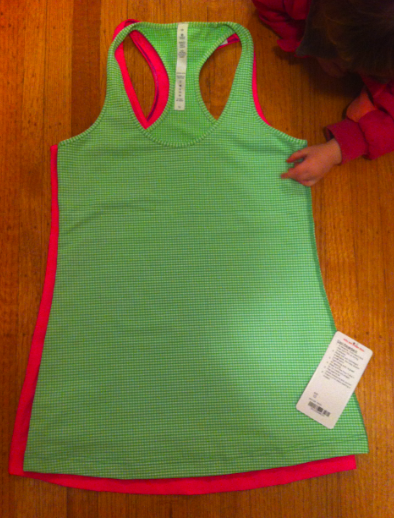 All this week I’ve been writing about how disappointed I am in the texture of this Gingham Frond Green Cool Racerback. I still am as it’s so warm that I’ll probably only wear it casually and not to Crossfit. I will try it out though and report back how wearable it is for sweaty workouts but I’m pretty sure I will suffer with heat exhaustion over wearing this one. Anything for my lovely readers though 🙂 I also agree that the close up of the gingham print looks sort of like a dish towel…but, when I opened my package up I realized how pretty the color is. Some prints depending on the scale end up reading as a different color rather than a print, and this is one of those. To me I see a light version of frond and not so much a gingham print. Its a pretty green apple green! The sizing is definitely weird on this one. I ordered a 10 and it is SNUG! Not just snug but the material is much more compressive than my 8’s. I’m not going to size up in this one but I think a lot of you will decide to do that when you try this one on. After 2 months and 19lbs down on the Whole30 diet, I’m on the cusp of a size 8, but my 10’s still look like my appropriate size. I was really surprised how snug this size 10 was. You can see in the picture I’ve added below how much smaller and shorter it is compared to my other size 10 Cool Racerback. It’s not just the size difference though, it’s the fabric and compression that makes it feel smaller. Maybe it has less lycra and more mechanical stretch. I dunno. Now, on to the Ebb and Flow II’s. There has been a LOT of chatter about sheerness on these and I agree that certain ones do tend to be quite sheer, Flare especially. I think the nature of this material just lends itself to really inconsistent batches and that is just the nature of these awesome pants. They require trying on several pairs, and sizing them correctly. Sizing down in them really degrades the lycra (faster than other pants) and you can end up with sagging pants despite an initially firm fit. I first purchased these in black, size 8 and they were sheer only when I went into a deep squat. Since these will be primarily used for Crossfit where I will do about 10 000 squats in front of an audience…a little bit sheer is not going to be acceptable to me. If they were for casual wear I would have been satisfied with the Black/Size 8. I then ordered the Deep Coal in size 8 and when they arrived I was pretty surprised at how opaque they are compared to the black. There is a slight color difference but only visible if you are really looking and you have both up close right next to each other. I think there was a really tiny batch of the greys made but if you see them in store I’d try them on as well as the black for a good comparison on opacity. I’m socking these ones away for when my current Ebb and Flow I’s wear down and I’m more solidly into size 8’s. "More Run: Pace Tank and Crop (Australia) Pictures"
"Sneak Peek From Australia: Special Edition Cool Racerback and Run: Pace Tanks"